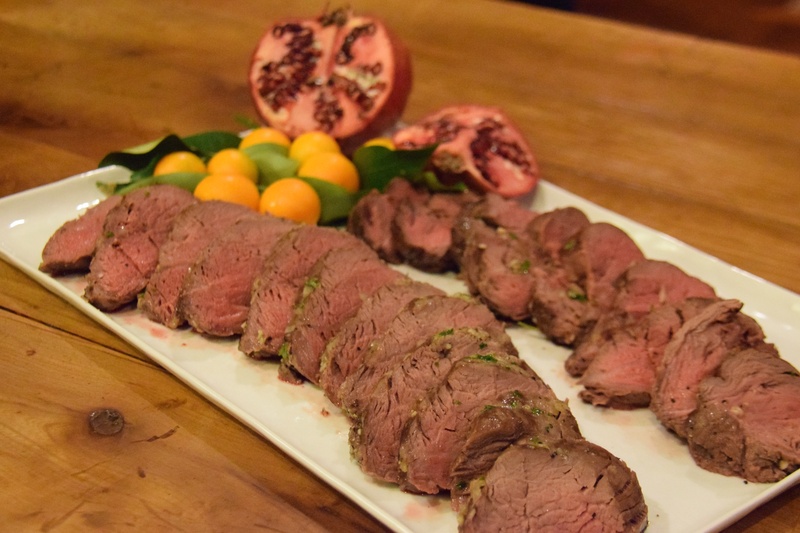 seriously BEST EVER roasted beef tenderloin | Is there any wine left? My nightmare would be working in the test kitchen at Cooks’ Illustrated. I love practically every recipe that they publish or show on their PBS show and I love that each one is perfect because it has been tested 30-40 times. You read that right — they remake each dish more than 30 times to be sure that the measurements are correct, the right ingredients are used, and the cooking times and methods recommended are exact. But seriously people… I love cooking but I get bored if we have green beans two days in a row. Though their repeat testing would kill me, I am super grateful that they are all up in Boston somewhere testing away. Because its that determination that produces killer recipes like the one for the PERFECT beef tenderloin. Take a 6-7 lb. tenderloin and slice about 3-4 inches off of each ends. Save the ends for a future use (like grinding for burgers — YUM). 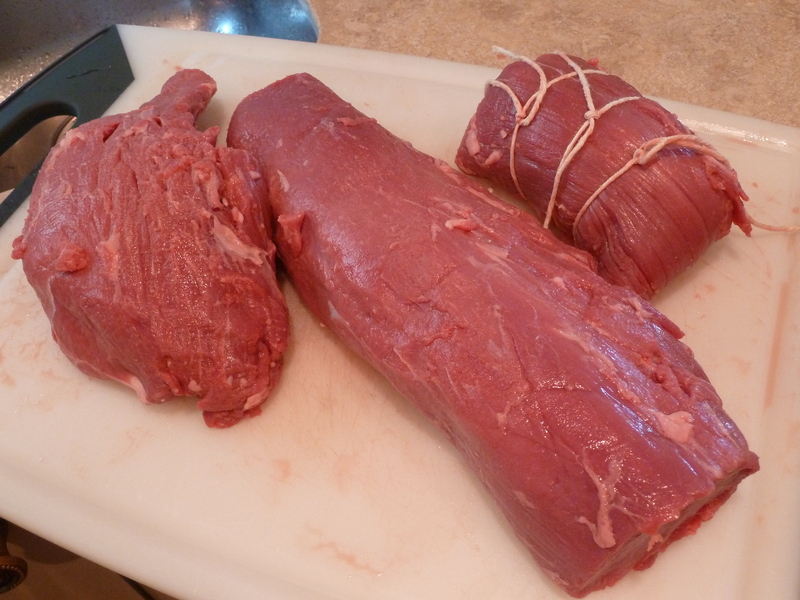 Tie the tenderloin at two-inch intervals so it is an even diameter along the whole roast. Sprinkle 2 teaspoons of the kosher salt over the whole tenderloin, cover with saran wrap and let sit on your counter for an hour. 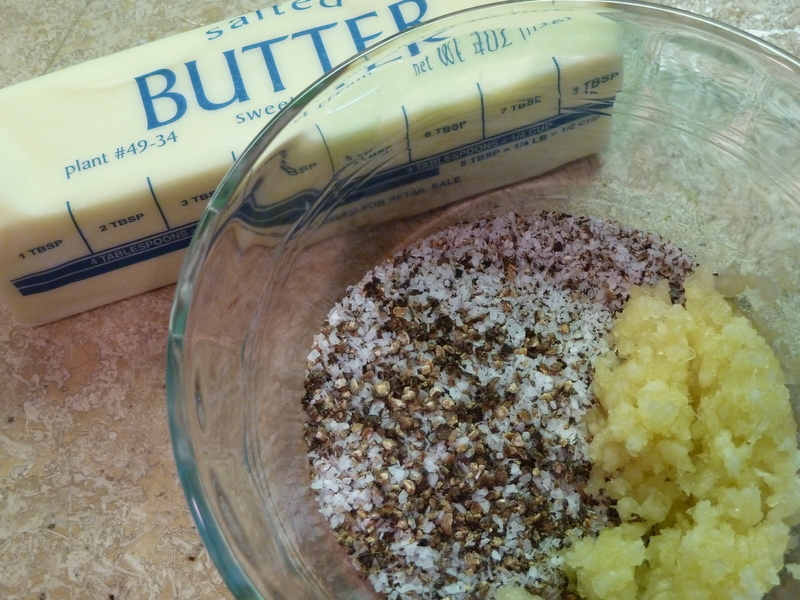 In a small bowl, mix the pepper, garlic, and remaining salt with 4 tablespoons salted butter. Pat the meat dry with paper towels and rub the tenderloin with the butter mixture. Really cover it here. There’s nothing to be ashamed about. Except maybe my cholesterol. Worries for another day…. Put the tenderloin on a wire rack set in a rimmed baking sheet in the preheated 300 degree F oven. After about 20 minutes, flip tenderloin. 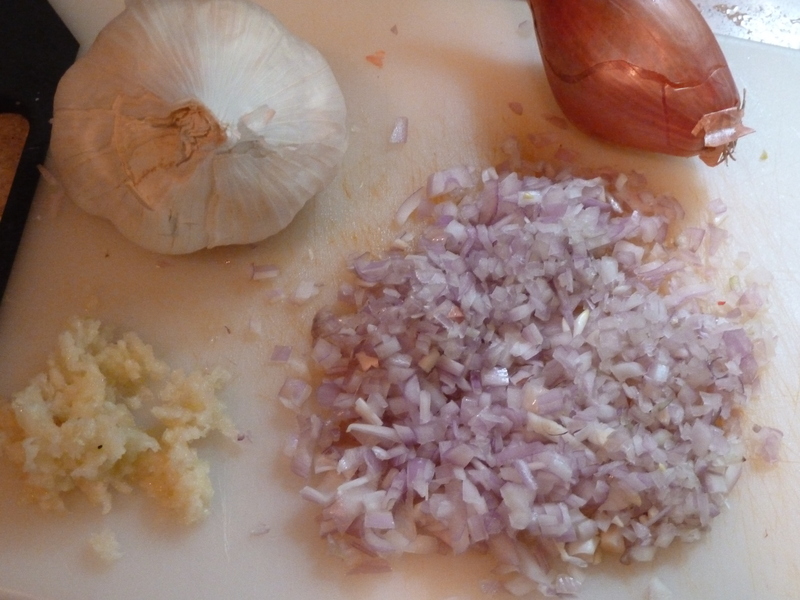 While the meat is cooking, finely chop the shallots and garlic. Mix with softened butter, salt, pepper and parsley. Set aside until the roast has come out of the oven. Roast the tenderloin until an instant-read thermometer inserted into center of roast registers 135-140 degrees F, about 55 to 60 minutes. The tenderloin will continue to cook after removing it from the oven, so take it out about 10 degrees rarer than you want to serve it. Transfer roast to cutting board and spread 2 tablespoons shallot-parsley butter evenly over top of roast; let rest about 10 minutes. 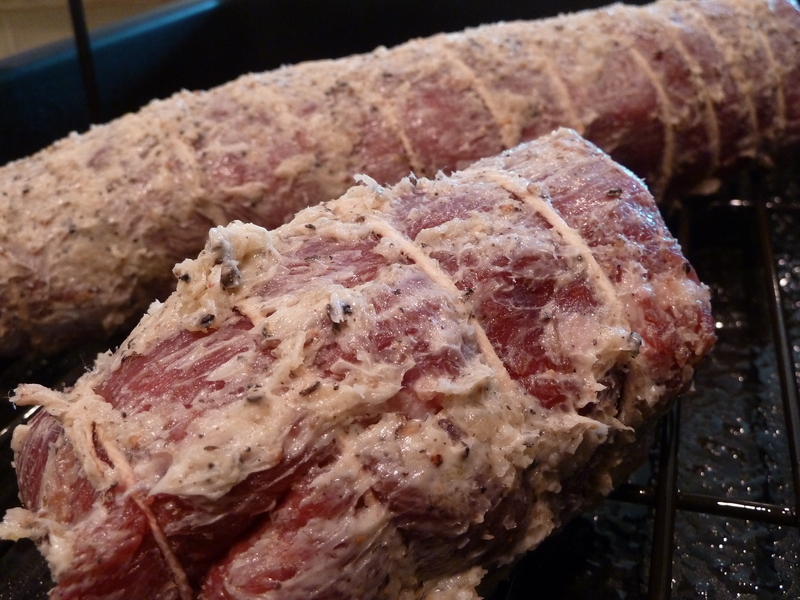 Remove twine and cut meat crosswise into ½-inch-thick slices. 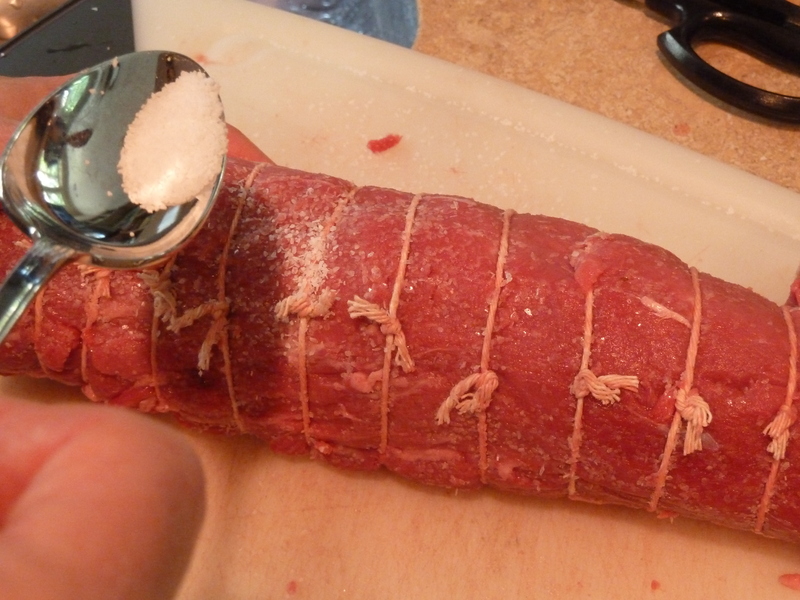 Trim tenderloin of all fat and silver skin and cut each end off about 3-4” to make it the same diameter from end to end. Reserve ends for future use. Tie the tenderloin crosswise at 2-inch intervals using cotton twine. Sprinkle roast evenly with 2 teaspoons of salt, cover loosely with plastic wrap, and let stand at room temperature 1 hour. In a small bowl, mix the pepper, garlic, and remaining salt with 4 tablespoons salted butter. Pat the meat dry with paper towels and rub the tenderloin with the butter mixture. Put the tenderloin on a wire rack set in a rimmed baking sheet in the preheated 300 degree F oven. After about 20 minutes, flip tenderloin. 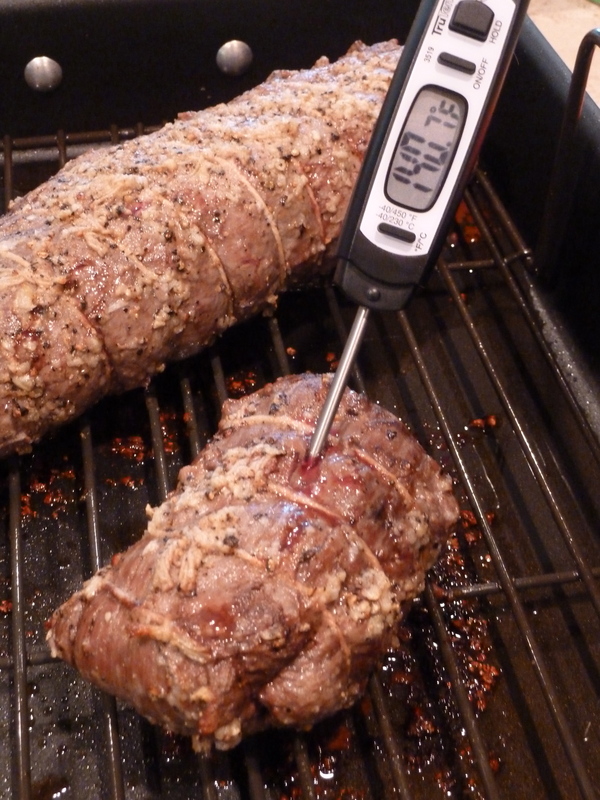 Roast until instant-read thermometer inserted into center of roast registers 135-140 degrees F, about 55 to 60 minutes. The tenderloin will continue to cook after removing it from the oven, so take it out about10 degrees rarer than you want to serve it. Good lord, Katie. That looks amazing! Poor Andrew, he is not marrying a cook 🙂 I could probably tackle the mojito recipe below, though! This meat melts like butter in your mouth. Honestly I havent ever had a better tenderloin in a restaurant. Katie, made 2 of these today …one to take to friends who just had triplets….she needs protein …. and the other for dinner with family. Amazingly fabulous! Had some of the finishing butter left and will freeze it to use on the burgers from the other portion of the tenderloins! Thanks …. Can’t wait to eat the leftovers! Iley, it depends on the size of your tenderloin — I assume 6 oz. per person. Hope you enjoy! Don’t cook it 20 min per pound or it will be overcooked!! In order to give it a few minutes to rest, I would start the entire process at 2 PM. This gives you time to sear it and to cook it in the oven. Katie I looked up a lot of recipes and yours seemed yummy, easy and just what I was looking for.I cooked a 7lb tenderloin, 20 mins on 300 and flipped it, started checking temp’s in 50 mins from there until it was 130 which was about 60 mins. Took it out flipped it and covered it in the butter sauce and let it rest 10 mins. I cannot tell you this was hands down the BEST tenderloin I have ever made. I made it for Christmas dinner and this morning my husband and I had it with eggs, just full of flavor and melts in your mouth. I have printed out your recipe and plan to teach my newly married daughter your secret to a perfect tenderloin. I love the name of your website and cant wait to use your recipes in the future! Thanks so much! YUM! So the shallot and garlic are not cooked? Yes, the shallots and garlic in the butter mixture are not cooked. They should be chopped very finely and they will soften as they sit on the hot meat. I like to serve beef tenderloin at medium temperature, not medium-rare. But if you prefer medium-rare, then definitely pull it out when it hits 125 degrees! Hi Stephanie! I wouldn’t pull it out at less than 125 — it will gain up to 10 degrees while resting and should be perfectly medium rare. Also, you can definitely sear it on the stovetop first, but I find that it creates a nice crust and holds the moisture in well by just cooking it in the oven. If you sear it on the stovetop, be sure not to do it for too long or the meat won’t be pink / red all the way to the edges. Hope it turns out well! In one post I see you mention searing the meat, but I don’t recall the instructions saying to sear the meat. I am making this Saturday night and I wanted to confirm if I should sear or not. Also, if all goes well on Saturday, I am making this for 60 people for my Mother’s 75th B-day party. Can I cook several in the oven at the same time? If so, will I need to cook longer? Thank you. You do not sear the tenderloin in this recipe. Also, you could cook more than one in oven at once, but it will take a few minutes longer. Just be sure to use a meat thermometer so that it does not overcook. Can’t wait to try this recipe! To save time am I able to put the butter mixture on the beef the night before wrap in plastic wrap and pull it out the next day to cook? I am presuming I have to let it set out for an hour before cooking. Its most helpful to do this all on one day so that you can salt the meat for the right amount of time before covering it in the butter mixture. But you can do those two steps beforehand if you are pressed for time. Definitely leave it out of the fridge for an hour or two before cooking though so it can come to room temperature — it will cook more evenly that way. Merry Christmas! I made this for my family for Christmas. I must say, this was honestly the best tenderloin I have ever made! Everyone raved about the flavor. I will never EVER make this any other way! I made this last night for a party with my dinner group. I followed the recipe exactly except for the temp to remove from the oven. I wanted the thickest part med rare with medium pieces at the ends. I removed from the oven at 130. It was the best piece of meat I have EVER had and everyone there agreed. We had eight people and there is only a small amount left. I served it with roasted heirloom cherry tomatoes. Thank you! I will be making this forever! Can this be made the day before and sliced the day of the party? Sounds like a great recipe. Yes! In fact, I am doing that very thing next Saturday for a party. I recommend using an electric knife to slice the beef so you can get thin, even pieces without destroying the shape. Enjoy! Could you cook in oven until internal temp is appx. 125 — remove from oven — and do a reverse sear in large skillet on stovetop — being careful not to over cook? That, hopefully, would produce a medium rare tenderloin. Has anybody served with wine reduction sauce? Thanks! I’m a real rock star when I make this tenderloin!! Everyone raves about it! Thanks for sharing! What is the point of tying up the tenderloin? I do not understand that part. Is there a way to do it that is best? Also, you put salt on it, then more again later, and it isn’t too salty? 4 TB of butter covers the entire roast too? And crosswise is the opposite of the grain, correct? Sorry for all the questions. Thank you. I promise it is not too salty! And yes, 1/2 stick of butter will be plenty for covering the tenderloin. Do you recommend roasting using the convection setting or conventional setting? For convection, do you need to lower the temperature as you do when baking? Additionally, could you use the bake setting as opposed to the roast setting? Thanks for answering these probably foolish questions. Either would be fine but I prefer convection. Also, when I use convection, I only lower my heat by about 15 degrees (even though my mom tells me to do it 25 degrees!!). My oven doesn’t have a “roast” setting, so I just hit the convection button. Hope that helps! Enjoy! I am preparing 3 tenderloins for Christmas eve dinner and I was planning on using an electric roaster. Will the time and temp be the same? I’m just trying to keep the oven free to prepare the other sides for the night. Also, would you recommend placing a bit of water in the bottom of the roaster? Hi! I have never used an electric roaster — I am so sorry I can’t tell you anything about how the tenderloin would do in one. I served this for Christmas dinner yesterday and it was a huge hit. This was by far the best tenderloin I have ever made. It was so tender it practically meltd in your mouth! This was amazing !! thank you for sharing this superb recipe!! This was the first time I made this and I thought, there’s NO WAY mine would turn out this good. SURPRISE!! It was just too easy I knew there had to be a catch somewhere. The tenderloin turned out simply BEAUTIFUL. It was sooooooooo good. We just finished it up tonight. Right out of the oven or served right out of the fridge it was to die for. I did change the spices up a bit and it suited our family just fine. Instead of the salt and pepper in the first step, I used 3 TBSP of steak seasoning with course salt and pepper, red pepper, garlic and paprika. I have printed this recipe for future use, it’s THAT good. I also cooked mine for a lot less time as we are rare to medium rare kind of people. So tender you could cut it with a fork. Thanks for this amazing recipe. I surprised myself with how easy it was to prepare. You owe i to yourself to try this. You will NOT be disappointed. I made two 4 pound roasts last night for Christmas and they were a huge hit! Fabulous recipe. The only think I would clarify is that you roast for a total of 75 minutes….20 minutes on one side then flipped and roasted for an additional 55 minutes. I was initially confused/concerned about total minutes to roast before I started since this was a new recipe for me….It was absolutely perfect…!! Highly recommend! Thank you!!!! Made this for Christmas too. I had about a 6.5 lb whole tenderloin, tied. I didn’t trim the ends. I cooked it about an hour, until it was 125. It was a bit too rare for me. Next time I will go maybe 130. Everyone loved it, and it was very very tender. The only other thing I will do next time is sear it. Not sure if I should do that before or after roasting, but I think it needs that little bit of carmelization. Otherwise fantastic technique. This was my first time making beef tenderloin, and now I’m not afraid to do it again. If you want to sear it, definitely do it afterwards- not before. Otherwise you’ll get a gray ring around the edges of the meat. I have grilled tenderloins in the past and everyone likes them. Used this recipe to cook whole tenderloin for Christmas dinner instead of grilling. It was by far the best tenderloin I have ever made. Perfect medium to medium rare and so tender you didn’t need a knife. For those folks who wanted medium well I put slices in a hot cast iron skillet for thirty seconds. Everyone said it was the best tenderloin that they have ever had. Thanks for the excellent pictures and instructions. I am doing this for New Year’s Eve dinner for 8. I have done all the mincing ahead and put it in zip locks as people will be here for cocktails first. I am only a bit unsure of the timing, so I am serving at 7 and plan to put this 5 1/2 pound tenderloin in at 5:30. Hope that is right. Will let you know how it goes. I have done a number of these on the grill but this is my first solo ib the oven I will have a glass or two of wine first. I’ll admit I was unsure about trying this recipe, but it turned out magnificently at our Christmas party. We had a large prime tenderloin that I would normally cook on my charcoal Weber, but the rain forced me inside, hence this recipe. Everyone raved about it and even my wife liked it who prefers something other than beef. I did have to cook it longer, about an hour and 10 to 15 minutes with the beef still on the rarer side all the way out to the edges. My question is have you ever tried this on a charcoal Weber rotisserie with some hickory chips and if so, any words of wisdom? Yesterday was my Dad’s B-day and I prepared this for a family dinner to celebrate. It was my first time cooking a roast so I was worried about how it would turn out (user error not the recipe), but to my surprise it was amazing!! Everyone raved about it! I accidentally bought salted butter so the only change I made to the recipe while preparing was cutting back on the use of salt. Thank you for such a great recipe, will definitely cook again!! I am cooking for 20 adults and plan on doing 2 tenderloins at the same time in a electric roaster. Please help with some ideas on how to have a great product doing it this way. We have large commercial convection ovens but they seem to dry things out and I am not able to stay there and watch the roasts as I am with the electric roaster. When doing more than one Tenderloin in the same oven do you add all the weights together for a total, or do you calculate the time on the largest roast? As advertised above! An outstanding result!…However, for you Yorkshire pudding lovers, Do Not use the drippings from the tenderloin as the result will extremely salty. Find an alternative source.